Unmanned aircraft systems provide the ideal solution to the problems and limitations faced by other surveillance methods. Drone surveillance presents an easier, faster, and cheaper method of data collection, and a number of other key advantages. Drone planes can enter narrow and confined spaces, produce minimal noise, and can be equipped with night vision cameras and thermal sensors, allowing them to provide imagery that the human eye is unable to detect. Traditional observational surveillance methods are typically limited by the stationary nature of the camera, which is usually handled manually or fixed upon a tripod or other structure. Aerial surveillance can be performed using a helicopter; whilst this achieves the desired result, it is also very costly. UAVs can quickly cover large and difficult-to-reach areas, reducing staff numbers and costs, and do not require much space for their operators. The U.S. Military UAV tier system is used by military planners to designate the various individual aircraft elements in an overall usage plan. Unmanned Ariel Vehicles can be categorised in terms of range/altitude. Hypersonic high-speed, supersonic, or more.. The type of UAV you will use depends on your application, eg the USA southern border is patrolled by MALE UAVs (Predator) for Detection, but this is supplement smaller drones for Identification and Situational Awareness during Response actions. ISR is the coordinated and integrated acquisition, processing and provision of timely, accurate, relevant, coherent and assured information and intelligence to the commanding officer’s conduct of activities. Examples of ISR systems include surveillance and reconnaissance systems ranging from satellites, to manned aircraft such as the U-2, to unmanned aircraft systems fixed wing or multi-copter. This includes DRI, SA and Response. Resolution required for Detection, Recognition, and Identification depends on the type of camera. Resolution for thermal cameras and optical IP cameras are measured differently. For example, when defining the performance of a thermal camera we use the Johnson Criteria of “detection”, “recognition” and “identification” (DRI). On the other hand, IP camera resolution performance is usually defined by the number of pixels in the sensor, and we are usually interested in the ability to identify a person. How much resolution do you need? This article compares how resolution is defined using thermal and optical technologies. In military circles, “identification” is used along with “detection”, and “recognition” as part of the DRI criteria established by John Johnson in 1958. Recognition: Sometimes we use this term when we want to recognize the object as a man or a woman. In this case we are interested in how people or vehicles are moving, rather than the details (identity) of the objects. Identification: In surveillance applications we usually mean identifying who a person is, or the license plate number, or maybe the numbers on the tail of a plane. Thermal cameras and optical cameras use totally different technology. The thermal cameras provide images based on the heat energy (Infra-Red) emitted by the object, while the optical camera provides an image from the light reflecting off the object. The optical IP cameras provide better detail than thermal cameras because they provide color video rather than the false color provided by monochrome thermal cameras. Color provides much more information and makes it easier to identify things. Since, the thermal cameras use heat energy from the target, they operate in total darkness, while optical cameras require some light source. To “see” at night with an optical IP camera, we use standard white light or IR light that reflects off the target. Optical cameras are sensitive to infra-red (IR) light, but at a different frequency than the thermal cameras. 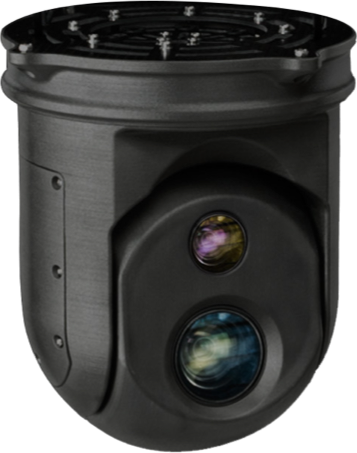 IR illuminators that operate at 850 nm or 940 nm can be used with IP cameras for night vision. We usually measure thermal resolution in line pairs, and we measure IP camera resolution in pixels. The Johnson criteria was based on experiments using observers. It estimates the number of line pairs across a target and indicates if there is at least 50% chance of the observer accurately achieving the criteria. One of the drawbacks of this method is that it is easy to detect a hot object from a distance, but it might be impossible to see with a thermal camera if the it’s the same temperature as the surroundings. Note that the Criteria was defined in cycles on target (or line pairs across a target). IP cameras use different criteria for detection, recognition and identification. Instead of line pairs, we use the pixel count to measure resolution. This provides a more defined way of determining what detail we can see. The resolution of IP Cameras is defined by how many megapixels they provide (1.2 megapixels, 2.0 megapixels, etc.). This is further defined by the horizontal and vertical pixel count (i.e. 1280 x 720, or 1920 x 1080, etc.). We also use pixels /ft. (or pixels/m) rather than pixels on target to determine the resolution we need for specific applications. Here is a summary of the criteria, with a description of what we can discern at a certain resolution (defined in pixels/ft.). Recognition 2.7 pixels/ft. This assumes we need at least 15 pixels across the target (that’s 5’ 7”), and allows us to determine if the target is a man or women (if they are wearing different clothes). Identification 80 pixels/ft. Usually refers to being able to identify a person you know, and requires about 40 pixels across the face. Thermal camera resolution is measured differently than Optical IP camera resolution. They use different technology. Thermal cameras are measured using line pairs and the DRI criteria, while optical cameras generally use pixels/ft. (or pixels/m). Different parts of the security industry have differing requirements, one can distinguish between two types of approach: monitoring Lines and monitoring Sites. In Line monitoring, fixed-wing UAVs are used to perform high-level highway, coastal and border surveillance. They can provide high-level feedback on illegal border crossing, smuggling or wild animal traffic. In terms of monitoring Sites, multi-rotors are used more frequently, as they provide higher manoeuvrability and can hover more easily. UAVs can provide live streaming of detailed data, follow objects or intruders from a safe distance and quickly cover a large area, but also record images that can identify whether part of a forest or a slag heap is missing. UAVs have found other applications in industrial plants: reducing the costs of asset theft, in addition to monitoring and verifying the quality of employee work. UAVs provide a rapid response and fast "eyes on" to the target area with live updates control stations while active waypoint tracking can be maintained based on the target parameters, like thermal signatures. A key advantage of UAVs is its ability to collect imagery, ideally suited for reconnaissance or rapid situation awareness with application for ground force units to detect and monitor potential threats from a safe distance. UAVs in perimeter security do not only reduce the requirement for foot patrols by security guards, but also provide an additional oversight in instances where security guards are deployed to ensure their adherence to patrolling routines. The speed, size, manoeuvrability and additional technologies make UAVs the perfect supplement to ground security teams seeking to perform monitoring tasks more quickly and efficiently. Drones have a competitive edge over stationary cameras, as intruders can’t easily step out of sight, and they can cover areas that are normally out of reach. Counter Piracy Operations: UAVs are useful to monitor, analyze and anticipate pirate vessel movements. This allows security forces to identify hazardous areas, potential assault locations and timings and evaluate piracy trends around the world. Super Yacht Security: UAVs are involved in protection services for super yachts which has helped crews to stay safe, reduced delays and minimized cost overruns. Such services add value by reducing insurance premiums and assuring stakeholders that company assets are secure. UAVs are instrumental in managing the critical facets of security & safety at major events, from event security infrastructure, through to spectator and crowd control and safety to overall health and safety planning. This includes the completion of initial security risk assessments to developing bespoke security infrastructure solutions. Areas covered include general security, such as vehicular access, landscapes, fire evacuation procedure and adaptation of the original building design. In addition to monitoring and rapid reaction, UAVs can provide detailed visual documentation of sites, enabling effective analysis, risk management and security planning. Abu Dhabi’s security company, uses UAVs to supplement its security system, especially around ports. UAVs are also used for monitoring and assessing the scale of accidents. This information enables authorities to delegate personnel more efficiently. Special Weapons and Tactics teams, also known as SWAT teams, are elite tactical units that have been trained to perform high-risk operations like hostage rescues. Members of a SWAT team are equipped with heavy-duty body armour, and often carry specialized firearms; they are also aided whenever possible by aerial assistance. Aerial assistance is essential in SWAT operations as it facilitates the tactical implementation of multi-angle information. This type of aerial assistance has traditionally been provided by helicopters. However, one of the main problems with helicopters is they are not typically kept in rural areas, so this slows down the response time as units have to wait for them to be deployed. Helicopters are also very noisy, and costly to run because they require professional personnel to operate them. Drone planes provide a safe and cost-effective alternative to helicopters. These unmanned aircraft systems can be deployed instantly when needed, cost a lot less than a helicopter, and also have a very low noise footprint so they’re suitable for use in sensitive missions. All of this means that drones can be deployed more frequently to SWAT teams, leading to safer conditions for both team members and civilians alike. Traffic monitoring is necessary for collecting data that provides a detailed description of the use and performance of road networks. There are two main ways to collect traffic data: by manually observing the roads, or by using electronic equipment to monitor roads at specific times. The data collected in traffic monitoring is used to support the safety, performance, and maintenance of the roads. Many traffic monitoring organizations use helicopters to achieve aerial views, or use cameras fixed above the roads. Both of these methods only serve one particular purpose, the cameras are difficult to move around efficiently, and using helicopters is too costly to use for repetitive road monitoring. Aerial surveillance drones offer a much more efficient and cost-effective alternative to helicopters and static cameras. Drones offer several advantages over traditional methods of traffic monitoring: they use waypoint navigation which allows them to be programmed to fly along specific routes repetitively; they can also be deployed to fly over specific roads and in specific situations. Unmanned aircraft are also significantly cheaper than helicopters, meaning they can be deployed more often, thus increasing the overall performance of the traffic monitoring operations. Poaching is the illegal hunting, capturing, or killing of non-domestic animals, and is in direct contradiction to the Endangered Species Act. Acts of poaching also encompass a failure to comply with the regulations surrounding hunting without a license, hunting at illegal locations, and hunting with illegal methods. There are a number of anti-poaching measures in place in National Parks and the habitats of game and wildlife, including the pre-emptive removal of horns to discourage poachers, as well as dying the horns a bright colour to make them undesirable to poachers. Poaching is typically related to large parks and habitats, and close surveillance of these areas is difficult. Aerial surveillance using helicopters can help to improve measures somewhat; however, helicopters are costly and noisy to they are not always a viable option. A surveillance drone is the ideal solution to the problems faced by other anti-poaching methods. Drones can be equipped with not only cameras, but also thermal sensors and sniffers that enable them to detect poachers and hazardous gases. Unmanned aircraft can cover large areas at a fraction of the cost of a helicopter; they can also be kept on site for rapid deployment, and they have a very low noise footprint which doesn’t disturb the animals or alert the poachers to the presence of the drone.